Things aren’t great in Europe. Economic growth has been anemic, and some economies in the eurozone are already contracting. Meanwhile inflation, which is one of the European Central Bank’s main goals, has been tepid. On Monday, former Bank of England economist Tony Yates wrote that the eurozone may have already fallen into deflation. And just last week, the Organisation for Economic Cooperation and Development, or OECD, published its latest growth projections for the global economy, which showed the eurozone growth lagging other major economies. This report also said the ECB needs to act to head off deflation, and while ECB president Mario Draghi last week reiterated the central bank’s intentions to increase the size of its balance sheet, it remains to be seen if these actions will be effective. 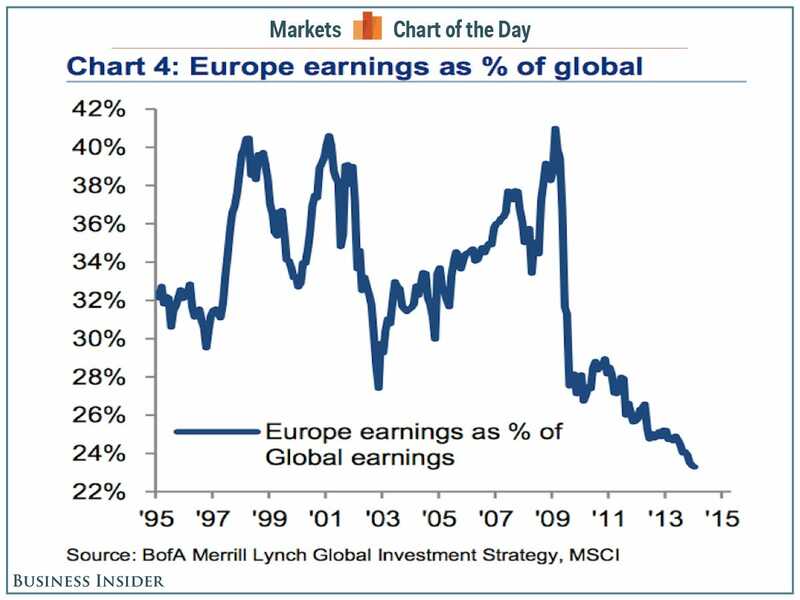 In a note to clients over the weekend, however, Bank of America Merrill Lynch strategist Michael Hartnett highlighted an even more troubling chart for Europe, which shows the declining percentage of global earnings coming from Europe. “25 years on from the fall of the Berlin Wall, and Europe is arguably one recession away from severe political and social stress,” Hartnett wrote. And signs of this stress have already popped up, as over the weekend 81% of voters in Catalan voted in favour of independence from Spain. 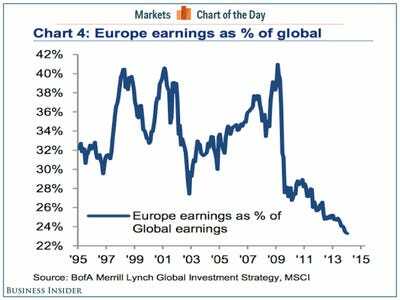 But aside from any one economic or political force, one thing is clear: the European economy is is decline.